Run Time: 134 min Rated: 14A (Canada) R (MPAA) for strong sequences of war violence, some grisly images, and language throughout. Set in April 1945 Fury focuses on a single M4 Sherman tank and its five-man crewled by tank commander Sergeant Don 'War-daddy' Collier (Brad Pitt). This fictional story is told against the backdrop of the very real final Allied push into Nazi-controlled Germany in the waning days of WWII. Taking on a new assistant driver/bow gunner, Norman Ellison (Logan Lerman) a naïve teenager who has only been in the army for 8 weeks, the crew of the tank (called Fury) presses on into the dangerous conditions of total warfare asthe Nazis have mobilized men, women and children in a last-ditch effort to turn the tide of the war. While young Private Norman is wet behind the ears, Sergeant Collier and the rest of the crew are war-wearied men who are both broken and hardened at the same time. As the film unfolds, Norman experiences the horrors of war as the grim exteriors of his fellow soldiers are gradually peeled back to expose textured, well-rounded characters. At its core Fury is not a sweeping epic but rather an intimate portrait of men in war. 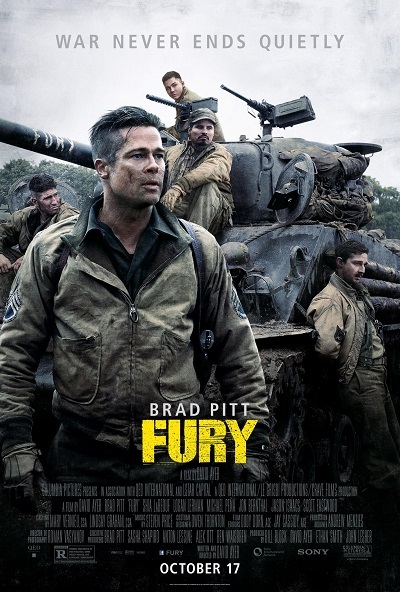 There is no obvious glamour in this film; Fury is exceedingly bleak and disheartening but also deeply religious. Writer and director David Ayer doesn't shy away from the religious elements of WWII including trucks with crucifixes affixed to the grill carrying the bodies of dead American soldiers. While there is no official chaplain in the film the characters in the tank are never far from their Christian faith. One of the first bits of dialogue involves a crew member commenting that they had survived because of luck to which Sergeant Collier responds, "Not luck; the grace of God." The gunner, Boyd 'Bible' Swan (Shia LaBeouf), quotes Scripture, prays the Lord's Prayer with dying men, says grace before meals and acts as Collier's conscience. The first thing 'Bible' asks Norman when he joins their crew is if he's a praying man, if he goes to church, and most importantly "Are you saved?" to which young Norman answers "I'm baptized." At the time the last question is rooted in the gunner’s revivalist decision theology but as Fury’s story expands, it becomes the central theme. Can men like Sergeant Collier or even their ammunition loader Grady (Jon Bernthal)—a uniquely unpleasant man who believes himself a lost cause—be saved? Martin Luther was asked the same sort of question and in 1526 produced a treatise called "Whether Soldiers, Too, Can be Saved." In it Luther makes a distinction between the right and godly vocation of soldier and those who fill it, and pointing out the importance of keeping rascals and scoundrels out of this profession. Those who carry the vocation of the sword can often find themselves facing the temptation to exploit authority by killing unjustly, extorting, and abusing the enemy or even citizens under their care. Repeatedly, Fury tackles the question of where or when the line is or isn't crossed in the theatre of war; when has a soldier acted justly in their vocation and when have they failed; and can a soldier be an instrument of Divine vengeance, can they perform God's will in their work? At a number of points in the film Ayer has the crew of the tank say together, like a kind of creed, "Best job I ever had!" This may appear to be ironic gallows humour, but under it they are showing reverence for the work they've been called into. A particularly grim and contemplative moment reveals the crew’s understanding of their work as a true vocation. The gunner, 'Bible', says to his crewmen, "Here's a Bible verse I think about sometimes. Many times. It goes: And I heard the voice of Lord saying: Whom shall I send and who will go for Us? And... I said: Here am I, send me!" Young Norman mumbles in response, "Send me." Sergeant "War-daddy" Collier surprises 'Bible' by saying, "Book of Isaiah, chapter six." Collier knows his Scripture and accepts that he's been called into the vocation of soldier. This becomes more evident when a little later in the film, while contemplating death, Collier paraphrases a portion of the second chapter of First John partly as a question, yet mostly as a personal hope, a confession of faith. In his treatise Luther comments that, "One would think that war was such an absorbing matter that [soldiers] were unable to think about God and their souls. Actually, however, we ought to think most about God and our souls when we are in danger of death." With death lurking around every corner, Ayer and Luther seem to be on the same page when it comes to the importance of a soldier’s conscience. 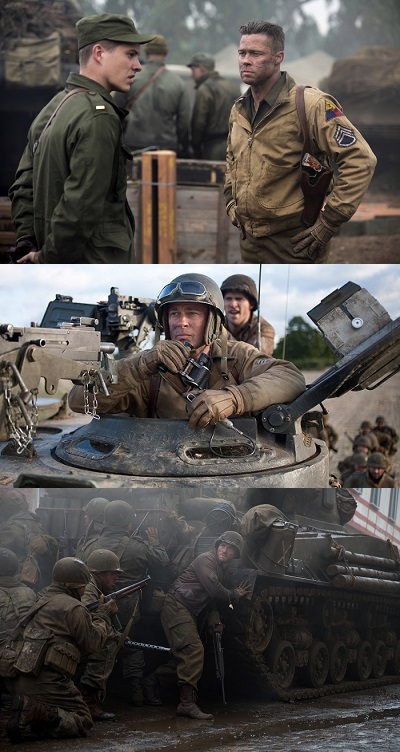 Fury takes the time to focus on more than historically accurate uniforms, tracer fire and tank turrets, it also shows that death in war can come swiftly thereby making a life of repentance all the more pressing. 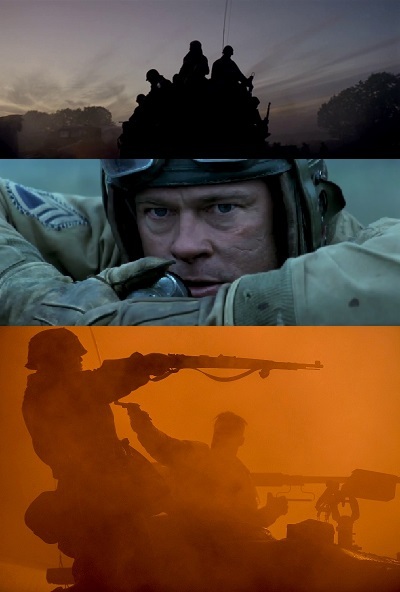 Although Brad Pitt's Sergeant Collier appears to vacillate between being the film’s hero and the villain, from the first scene Ayer cleverly indicates he is a man living his vocation in a state of repentance and grace.As Fury opens, in the quiet following the end of a battle, Collier springs from the safety of his disabled tank knocking to the ground and killing a single Nazi officer who's riding a white horse through the carnage of the battlefield. Collier shows no mercy to the Nazi but kindly spares the white horse sending it away unharmed. Later in a high tension scene Sergeant Collier's driver, Trini 'Gordo' Garcia (Michael Peña), vividly recounts a traumatizing incident in France after D-Day when they'd linked up with the Canadian and the British forces and destroyed a retreating German Army. Recalling the aftermath of the battle he says that, "your eyes see it but your head can't make sense of it." Trini continues, telling how for three whole days, day and night, they shot wounded horses. He mentions the screams of the horses and as he tells the story viewers understand why Collier spared the white horse at the beginning of the film; Collier wants to act justly in his vocation. He isn't interested in destruction for destruction’s sake. He wants to do better—better than he did those three days in France. The reason Collier’s character appears to vacillate between being the hero and the villain is because Ayer shows him both succeeding and failing to act justly. This is what makes Fury a compelling drama. This is not a movie for everyone; it is very challenging to watch. However, there is something in Fury for both “hawks” and “doves”. Hawkish viewers see more than enough horror to provide pause in any rush to warfare. For doves who manage to stomach the grizzly violence and troubling images, Ayer provides a window into the conscience of a soldier and hopefully they will garner from that an appreciation for the difficulties of the vocation. Both can walk away with a greater appreciation for the theological aspect of being a soldier. Fury has more in common with films like Das Boot (1981) and Saving Private Ryan (1998) than it does with Quentin Tarantino’s Inglourious Basterds (2009) or lighter WWII fare like this year’s The Monuments Men. While told in a rather one-sided fashion, Fury still manages to refrain from being overtly jingoistic and provides a sober look at war, honestly considering both the soldier and the vocation of soldier. The Rev. Ted Giese is associate pastor of Mount Olive Lutheran Church, Regina, Saskatchewan, Canada; a contributor to Reformation Rush Hour on KFUO AM Radio, The Canadian Lutheran and Reporter; and movie reviewer for the “Issues, Etc.” radio program. Follow Pastor Giese on Twitter @RevTedGiese. The war would end on May 8, 1945. "Whether Soldiers, Too, Can be Saved." Luther's Works, American Edition. Volume 46 Christian in Society III, Concordia Publishing House, pg 94.